In Skyrim you learn Dragon Shouts that let you do awesome things like breathe fire, cross a distance in the blink of an eye, and even force a flying dragon to the ground. The Become Ethereal shout temporarily suspends you between the physical and spiritual worlds. You cannot harm anyone, and more importantly, you cannot be harmed. Combine that with invisibility, and you basically have the only way I feel I can safely exist right now. One of my classes is about group therapy, intended to train students to be good group therapists. We’re reading The Theory and Practice of Group Therapy by Irvin Yalom. Before today I would have said that the more I read it, the more I want(ed) to participate in group therapy as a client. I think I need to have that experience for my own healing and before I can responsibly become a therapist. The feeling was coming up as I read before class today, so I decided to call and see about joining the psych counseling group I mentioned in my previous post. The receptionist asked if I’d ever worked with campus psych services before. I said I’d tried but been unsuccessful. Then she said she didn’t know if the group was still open and transferred me to the person in charge of it. No answer, so I left a voicemail. No response (yet). I tried joining a group by this organization once before. The person I’d spoken with had said she didn’t think short-term therapy would be good for me given my psych issues. Even though she offered to refer me elsewhere, I felt rejected. My experience today brought up the expectation that this is likely to happen again; they probably don’t want to deal with anyone who has severe – or even moderate – mental health issues. The clinic Fox and I have been going to doesn’t offer groups that would be appropriate and won’t give me a referral. Even Wakana hasn’t been helpful in this department. I doubt I could find an appropriate group covered by my insurance, and Mom already seems to resent paying for my individual music therapy. I feel like there is no place for me. I kept reading and what I read confirmed my fears. The very issues driving me to pursue group therapy would probably make me incompatible with the group they’ve created (to address a separate issue that’s just as important to me as any of the members they’ve deemed worthy of it). If I’m not a good fit, then I won’t benefit and may be harmful to the group. And even if I were granted the privilege of joining a group, the early stages might be toxic for me. They consist of people measuring each other up and jockeying for position in the group. Initial attempts at unity and mutual support degrade as members become very critical of each other. I fear that in such an environment I would at best be ignored and at worst become a scapegoat… or just be outright rejected! I wondered if this might be happening in class and felt unsafe with it. I thought that if it’s already bringing up all these issues, maybe I should drop the class. But if I do that, it will definitely take me much, much longer than the allowed time to graduate. I already need to request an additional year – that still might not give me enough time. Then I read Yalom’s thoughts about tardiness and absenteeism and started to feel guilty about all the (non-therapeutic) groups I’ve left. I’d be running late for some reason, then embarrassed about being late so I wouldn’t go, and finally feeling weird about missing meetings so I’d drop out. I’ve done this more times than I can count. Any group leader would be wise to exclude me. The more I read about how harmful this behavior is, the worse I felt. All the while the clock was ticking. I couldn’t even finish the chapter before it was time to go to class. I took too long in the bathroom. I felt anxious about my inevitable tardiness, but resolved to go to class because there’s a very strict attendance policy. I looked at the time and realized that even though I was quite late, there was still the majority of the scheduled class time. I could still get quite a bit out of it. I tried to muster up the courage and looked in the room again… but still didn’t see any easily-accessible open seats. Anxiety got the best of me and I left, feeling defeated. I’m not sure how I got home in one piece. I crept back into my apartment and hid. No. Everyone who could help is probably busy, unavailable, or has more important things to do. They would be upset. You shouldn’t bother them. content notes: From this point on, assume I’m being sarcastic, unless otherwise indicated. I’m so grateful to my APN for forcing me to schedule a sleep study at the particular center she chose! I met the most wonderful doctor ever at my consultation. He had the miraculous ability to diagnose me with obstructive sleep apnea before conducting an actual sleep study, based on my answers to a few questions – and my weight! Did you know that losing weight will solve all of my problems, including but not limited to sleep apnea! Clearly my lifelong history of depression, irritability, and anxiety are the result of my recent weight gain (which caused the sleep apnea) and not a lifetime of difficult family dynamics, codependency, emotional & physical abuse, and painful losses I never fully mourned. If I just lose weight, the sleep apnea will go away and I’ll be a happy, healthy, energetic, fully-functional adult! I’m so excited I want to go bake some cookies – but I won’t eat them! I thought I was going to learn more about what the sleep study will entail: what kinds of tests they’ll run, what I’ll be expected to do, what treatment options might be proposed. Maybe a boring discussion about “practical” things like what my insurance is likely to cover and how I can access whatever I’ll need to get a better night’s sleep… why would I ever want that? I’m so glad that instead, I got a lovely lecture on how weight loss could help me. You know, there really is an unfortunate shortage of information about dieting and what ideal bodies look like in this culture. I could almost cry to think of how fortunate I’ll be to have the opportunity to consult with a nutritionist and learn things about healthy eating that aren’t plastered all over the internet and every physical object that stands still long enough! Even more exciting is the idea of having an exercise regimen! Ooh! The word “regimen” inspires so much joyful anticipation in me! I wonder how many crunches I’ll have to do each day, and how frequently the number will increase. Most of all, I look forward to seeing the expressions of disappointment and hearing the additional lectures about how important weight loss is every time the number on the scale isn’t what they’ve determined it should be. I just revel to think of it! [not sarcastic: Actually, if they require me to adhere to an exercise regimen and be held accountable to someone else for weight loss – especially if treatment for my very real and serious mood disorder is contingent upon my successful compliance – I will … be dangerously tempted to kill myself. By far, the best part of today’s consultation was the rapport I developed with this amazing doctor. I was worried that he might listen to me when I told him about how my past efforts to intentionally lose weight have resulted in long-term weight gain. It would have been so terrible if he had respected my silly assertion that I “don’t” want to have bariatric surgery. Ah, what a relief it is to have a doctor who dismisses my clearly-stated preference to receive treatment for the condition that brought me to his office in the first place. I’m so glad he spent most of our time together advertising for a surgeon he knows. Now I have the name and number of a doctor I may never be able to afford, and who most certainly doesn’t take my health insurance! I have never been more blessed. I can’t wait to go to the surgeon’s free seminar and plead with him to take mercy on my poor obese soul by mutilating my body for a reduced cost. Perhaps he will take pity on me by referring me to a butcher whose fees are within my meager budget. I shall commence saving for it immediately. I know! Let’s use the money we foolishly used to spend on groceries! That should kill two birds with one stone. I helped Fox get out the door this morning, so he could be on time for an early shift. That felt good. I saw the sun rise. I got to hug him. I got to feel like I was doing something meaningful. Now he’s gone and I’m surrounded by clutter. I’m tired. I look at my music instruments and feel sad, like my best friend has gone away. Oh, wait, she has. Banji was visiting for the holidays – but she had to go back to where she’s been living, a 5-hour drive away. It hit me much harder than I’d expected. She’ll be back soon. And I can visit her. Weather permitting, of course. But I still miss her. My heart’s been torn out and driven 5 hours away. Courses. I need to get an extension so I can finish my degree. I’m afraid the dean will say “no,” or that it won’t be enough. I don’t think I’ll be accepted again if I have to re-apply to my program, and I can’t afford to re-take courses. My student debt is crushing enough. I’m supposed to re-take the courses I had to drop 2 years ago because they were provoking suicidal thoughts. I was hurting myself – not doing any real damage, just causing lots of physical pain – on a regular basis because it was the only way I could get home from classes in one piece. So much was supposed to change between then and now: I was supposed to get better, to improve my music skills so I’d feel more confident using them in class, to become a normal functioning adult. Now I can’t carry a bowl from one room to another without it shattering at my feet. I was doing better for a while – or so I thought. I learned a lot. I think that stuff is still with me, it’s hard to say. These depression and anxiety goggles are so thick and heavy I can barely lift my head. But none of that matters. What matters is that something as simple as the holidays being over can still throw me into a deep depression like this. How can I live? How can I accomplish any of my goals and dreams? Skyrim is my stasis chamber. It’s how I (am currently trying to) survive the long journey through the void of strong depression between planets of… mild depression. a day with depression turns 2! A bar graph showing monthly visitors (dark blue) and views (light blue) from December 2012 through 1:29pm EST on December 13, 2014. A map of the world showing countries color-coded according to how many views were by people in that country. Colors range from pale yellow (least views) to bright fushia (most views). Countries are listed on the left side of the image in order from most to least views. 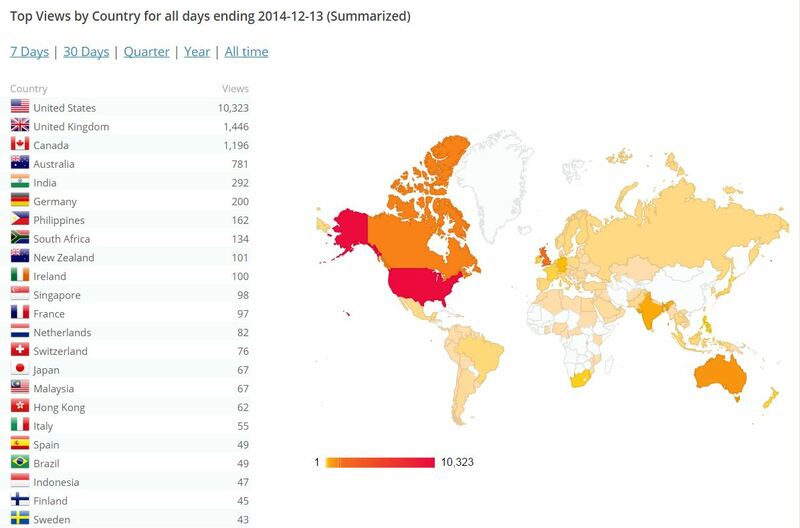 Most views of this blog are from the U.S. (10,323) the U.K. (1,446), Canada (1,196), and Australia (781). So much has happened over the past 2 years, I really don’t think I could do it justice if I tried to write a summary. I do want to point out that my very first post – which I broke into 3 parts – was about my not-so-successful attempts to find the right medication to help manage my symptoms. I later realized that what I really needed was to find the right psychiatrist, then eventually learned that the best person for me to see (whom I could afford and access) was actually an advanced practice nurse. Her willingness to listen to me and trust me as an expert in my own needs and experiences saved us both a lot of time and headache, and I think I’m now on a very good if not the best currently-available medication for me (Lamictal/lamotrigine). We’re slowly increasing my dose to a therapeutic level and I’m already seeing some benefit, with minimal side effects. Finally! I wrote quarterly reviews during my first year of blogging; they express my slightly-longer-term perspective on what was going on at the time. I suppose you could say 2014 has been less efficiently documented. I started out the year by making a resolution to remember that, whether I’m having the best day of my life or the worst, I’m always the “real” me. I think I did a good job of keeping to that resolution. I also renewed my commitment to the Blog for Mental Health Project. In February I let go of the emotional burden I’d been carrying around since my father died 16 – now almost 17 – years ago. It was a great healing experience but I still miss him; sometimes I think I miss him more. In March I announced that I aim to misbehave when it comes to talking about depression – that is, to talk and write about it as honestly as I’m able when I’m experiencing my symptoms at their worst, not just “after the fact” when I can put it all in a neat, “sane” package. I also allied with the part of me that fears “recovering” – getting a job, raising a family, all the stuff we’re supposed to strive for – because of the risk that I’ll stop taking care of myself. That theme has recurred during the year, including quite recently, as I struggle to be responsive to my own emotional and other needs and also get back into the activities and goals that were (are?) important to me. To be honest, I think I need to let the storm that is the “holiday season” blow over before I can really focus on such things. In May I wrote a bit about shame and how it is addressed in Frozen, particularly in the song “Fixer-Upper.” During a family reunion I also wrote about my need to detach emotionally from the intense emotional chaos that was going on around me. Later I realized that a lot of the not-so-savory emotions I was feeling were “borrowed” from one of my aunts; had I taken a step back to say, “that’s how she feels. How do I feel?” the whole experience probably would have been a lot less intense. June was a difficult month, particularly for my marriage. I was feeling more energized and motivated to pursue my career goals, and very frustrated with Fox for not being on the same page. I actually broke up with him – or at least tried to do so, but he convinced me to give him a chance to make things better. I realized I needed to separate myself from Mom, who I’m sure meant well but was encouraging my feelings toward separation from Fox more than I needed – not providing the balance that would help me figure out what I really wanted. Toward that end I revisited addressing my codependency and the ways in which I’m a reactionary. I realized that my worst fear is that I will give up on myself and commit suicide. Finally, I decided that I needed to listen to myself and went back through blog posts leading up to my legal marriage ceremony in November 2013 to find places where I expressed problems in our relationship, doubt, or insecurity. Now I’m thinking it’s probably not very helpful to dive into all that negativity without also looking at the positive aspects as well – a key tendency in depression – but at the time it was what I needed to do. It helped me find and assert myself and, most importantly, address those issues. In July we started the marriage counseling that has not only revitalized and strengthened our marriage, but also benefited our mental health as individuals immensely. Most of my posts from that month have to do with taking time to figure out what I want and asserting myself in my interactions with others. Very importantly, this includes expressing my emotions even – especially! – when I think they will be difficult for others to hear. I had my first meeting with my advanced practice nurse (APN) on July 31. August. The good news is, Fox started seeing a psychiatrist (part 1, part 2) and taking the medication (Wellbutrin/bupropion) that has been helping him a great deal over the past four months. I also started tracking my depression symptoms / severity on the Burns Depression Checklist – something I was able to do consistently for 3.5 months (and only stopped because I’ve found something better!). The bad news is, Robin Williams committed suicide… I still don’t think I’m ready to write about how that has affected me. The month ended soon after our pet rat, Trouble, was having so much difficulty breathing the only humane thing we could do was put him to sleep. In September I went to my first (and so far only) depression / bipolar support group meeting, but was more frazzled by it than anything else. It’s good to know that it’s there for if and when I decide I’m ready to try it again. I also (finally) read The Drama of the Gifted Child, which helped me face the reality of my own childhood and commit even more strongly to nurturing and expressing my true self – emotions, needs, wants, etc. I started taking Lamictal/lamotrigine on the 29th. On the 30th something extraordinary happened: the persona who had been controlling my interactions with the rest of the world – often if not practically always at the expense of my true self – resigned, allowing zir adaptive aspects to be integrated without the not-so-desirable consequences. That left, well, me – the true self – in charge. In October I recognized that the (now deceased/integrated) persona I’ve taken to calling the Censor, and my “mental illness” in general, are a collection of once-adaptive behaviors I developed to ensure my own survival. That’s a far cry from them being separate from or imposed upon me, and much much closer to that original resolution I made back in January. It helps me to be much kinder to myself and more engaged in the process of healing, becoming whomever I want and/or need to become. Speaking of need, I decided that the next step in the process is to get out and interact with people in groups and develop my social skills, but so far I haven’t been able to face my fears. Finally, October marked the first time in way too long that I was able to go for multiple days – even multiple weeks – without having any suicidal thoughts. By early November my emotional norm was to be considerably less depressed, in the “mild depression” and even “normal but unhappy” ranges according to Burns. It was quite a nice place to be, I’d like to get back there. On the first anniversary of our legal marriage, Fox and I reaffirmed our commitment to each other in front of our combined family and friends. Then we threw the best party ever! I had an absolute blast and will enjoy reminiscing about the experience, well, hopefully for several decades. I needed some time to process and integrate the not-so-good aspects of the experience, but I think I’ve accepted them… adequately. It was a very complex, intensely emotional experience, and I’m so glad I got to have it and share it with the people closest to me. I’ve been in a difficult low since the wedding. At first it was exhaustion from the event, and over time I became more and more frustrated with not being able to do the things I’d hoped I could, riding the energy from all the planning and joy of the event itself. I lost my motivation. Now, with the holidays looming, I feel like I’m hanging onto a raft in the middle of a raging sea; I need to find solid ground before I can try to build anything. At least the work Mom was having done on the roof is finished, so I’m able to get a decent night’s sleep and wake (more or less) on my own terms. I enjoy spending time with people I care about and try to get a healthy dose of social interaction every day. It seems the healthiest thing I can do right now is just accept that I need to focus on my emotional needs and “take care of myself,” as Wakana put it. 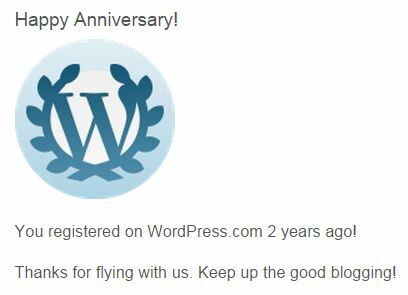 In short, I’ve grown a whole lot over the past year, and my first year of blogging definitely helped set me up to be able to do it. This blog has benefited me immensely. I hope it has helped others as well. I’ve been tracking my symptoms on the Burns Depression Checklist for another month; so far so good. (view July-August & August-September) Scores have remained in the teens on half the days, a phenomenon that was previously unheard of. My average score for the month was a 22, which is 10 points lower than last month! Ziya’s scores on the Burns Depression Checklist from September 16 to October 16, 2014. There are several factors I believe have contributed to my improved mood. Reading The Drama of the Gifted Child inspired some profound healing in the last full week of September. The most conventionally “sane” way to word it is probably that the emotional and presenting-myself-to-the-world aspects of my psyche became more integrated, so I can acknowledge, express, and act upon my emotions more easily. This helps me to feel more alive; all the energy that went into suppressing my emotions is now available for, well, whatever I want to do. It’s wonderful and amazing and just… Wow! I started taking the Lamictal my APN prescribed on Monday, September 29th. This is represented visually on the graph above by a vertical purple line. I’ve been taking the Lamictal consistently at about the same time every day for over two weeks. I hesitate to say it’s working just yet, but so far I’m feeling very positive about it. In addition to the Lamictal, I started taking Omega 3 and Vitamin D supplements on October 8th. Finally, the dates that have a blue horizontal line under them in the graph above are days I spent with Banji. This past weekend was particularly wonderful; we got away from the stress of our respective lives and got to spend a few days talking, making art, playing music together, and enjoying the fall foliage. I went about 24 hours without using a computer or smart phone and it was amazing! I had all this time; I didn’t know what to do with myself! So I colored in my sketchpad, took a walk outside, tried to sneak around like my Skyrim character, and interacted with living breathing 3-dimensional people using spoken words, vocal inflections, and facial expressions. And laughed, oh, the laughter! I even cooked and cleaned up afterward! By the time I got home I was a bit tired of socializing and just wanted some time to myself. I tried to play The Sims 3 – not the best or healthiest choice, I know – and ran into all sorts of crazy glitches. I got very frustrated because people kept interrupting me, especially my mother. I try so hard and I think she does too but I still find our conversations to be emotionally draining – especially when she’s hounding me about the things I still need to do for the wedding. That just makes me want to shut down and block everything out even more! Considering the abrupt change from vacationing with Banji to feeling emotionally drained at home without her and not coping all that well, I’m optimistic to see my scores gradually climbing from 13 on Monday to 30 yesterday. It’s less disruptive than the wild oscillations I’ve experienced in the past; I expect that I can bring the score back down (representing a reduction in depressive symptoms) by practicing some of the things I enjoyed so much while on vacation: less time in front of the computer, more time engaged in creative pursuits. Another way to reduce my symptoms is to actually do the things Mom’s been hounding me about, because then she won’t feel so anxious anymore, so she’ll have less emotional garbage to heap on me. This solution has the added benefit of completing the steps necessary to successfully prepare for my wedding. Win-win! Ziya’s (standardized) scores on the subcategories of the Burns Depression Checklist from September 16 to October 16, 2014. There are multiple instances when the purple line drops to 0 and disappears, indicating multiple consecutive days with no suicidal urges! Considering the presence of other, shorter periods of time with no suicidal thoughts or urges earlier in the month, I’m optimistic that this has the potential to become my new norm. And that, oh wow! It’s not just about wanting to live. It’s wanting and being able to live while also being true to oneself. It’s having multiple options; seeing the full complexity of a difficult situation instead of just the discouraging parts. It’s knowing where my toolbox is, seeing the tools when I open it, having the confidence to use them, and making creative use of duct tape. If staying alive were enough, we wouldn’t be considering suicide. To be perfectly honest, I dread and resent this day. I know that’s a very unpopular opinion, but I’m not sorry. I just can’t embrace it and write a tearjerker post about my close calls with suicide and how glad I am that I didn’t succeed.